Wingspan 5 to 6 mm. Areas where the larval foodplants are present. The adult moths emerge in a single generation in June. The larvae of this species form mines on Hawthorn, Apple, Pear and Wild Cherry. 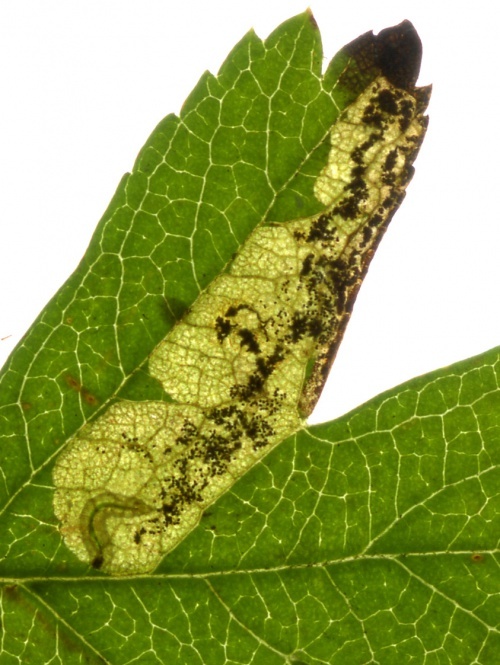 Initially, the larvae form galleries along the edge of the leaf, leading to the development of large blotches on the leaf margin. Widespread throughout England and Wales. In the Butterfly Conservation's Microlepidoptera Report 2011 this species was classified as common. Occasional in Leicestershire and Rutland. L&R Moth Group status = C (very scarce resident or rare migrant).